It’s time for another BoTB/Empties post! This post has come at a very convenient time, as I’m moving house in just over a week. I’d been collecting up my empty bottles like a good blogger, when my mum took one look at them and said ‘you must be joking if you think your rubbish is moving with us’. I guess she’s right, it would be madness! Luckily, I’ve collected enough to write a decent sized post, so I don’t have to waste space packing empty bottles. I’ve loved using Snow Fairy – the smell is out of this world! I only had a tiny bottle though, and Snow Fairy is only available to buy over the Christmas period, so I’ve been using it as little as possible. Sadly, it’s all gone now. I can’t wait until December, when I will be buying the biggest bottle I can find! If I could only buy one product from Lush, it would be the Dark Angels cleanser. I’ve mentioned it in a previous empties post, and I picked some more up in my Lush Haul in May. I’ve been using it as my morning cleanser – using it just once a day, with a separate cleanser in the evening, has made it last a lot longer! I could rave about Dark Angels for hours, it does such amazing things to my face. Next time I’m in Lush, a new pot will be the first thing in my basket. If I’m honest, this is the first Lush product I’ve been disappointed with. I have very long, thick, bleached hair which is prone to dryness, split ends, breakage and frizz. I need a really strong, hydrating conditioner to keep it looking beaut. While American Cream did do a fantastic job, I had to use such a large amount to get results I was happy with that it just isn’t cost effective for me! It does smell delicious though, and would be great on less troublesome hair. However, I won’t be repurchasing. Another Christmas present I’ve really enjoyed using is this Indian Night Jasmine Shower Gel from the Body Shop. I used to absolutely love the scent, but sadly it now just reminds me too strongly of the college history trip to Belgium that I took the perfume on. I love the Body Shop formulas though, so I’ll be heading back to try some of their other shower gels! I’ve seen a million and one reviews about this makeup remover, and micellar waters in general, so I don’t see much point in posting my own. However, that’s not to say micellar water isn’t 100% worth the hype! I used to hate makeup remover products, as they invariably involve aggressive face scrubbing and occasionally break-outs. I love Garnier’s Micellar Water though – makeup and dirt just glides off, and my face is left clean and ready for cleansing! I couldn’t live without it now, and I’ve already repurchased. It’s not particularly glamorous, but E45 cream is the business. It’s meant for dry skin conditions like eczema, but I just use it on my dry patches. 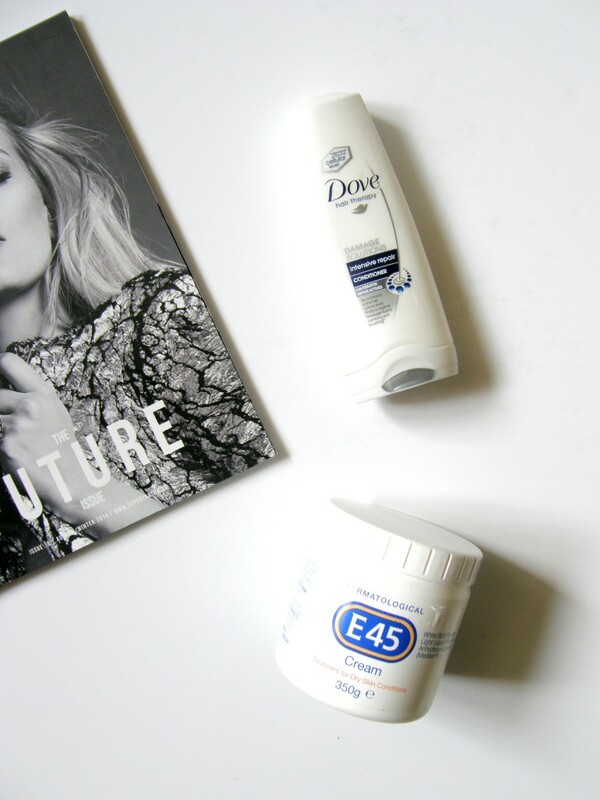 E45 is a basic, no-frills, heavy-duty cream – no messing about. For me, it’s a bathroom essential and I’ll be stocking up as soon as possible. These empties posts really aren’t the most glamorous thing in the world, but I love reading other peoples! Writing them is always interesting too; they make me really think about the products I’m using, what my opinions are on them, and whether I’ll repurchase! What products have you recently finished? Will you buy them again?